Douglas Hammet, former senior pastor of Lehigh Valley Baptist Church, Lehigh Valley, PA and is now serving the Lord as a Missionary to Botswana, South Africa has put together an extremely useful and practical book on finding God's will. 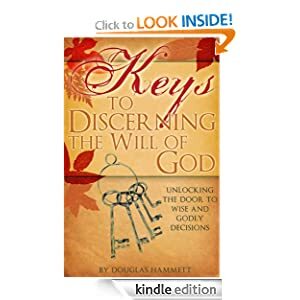 The subtitle is: "Unlocking the door to wise and godly decisions." God's will is such a vital topic because God does have a perfect will for everyone! I really love the first key "Trust the God of the Plan." The following chapters are just loaded with practical insights and Bible solutions to seemingly difficult situations that believers face in attempting to find or discern God's will. 168 pages of good reading material! You may place an order by contacting Challenge Press at 610-965-4700 or visit their website at www.lvbaptist.org. Also, you can go to amazon.com and purchase the Kindle edition. One more information, if you don't know it yet, you can also follow Douglas Hammet on Twitter (@DougHammett). Published by Challenge Press (C) 2008, soft cover, 168 pages.